bitforms gallery is pleased to announce A Coded Language, Beryl Korot’s second solo exhibition with the gallery. It features paintings on traditional and handwoven canvas, video, and drawings with ink and thread, highlighting the breadth of the artist’s practice across multiple media forms from 1980 to 2017. The works on canvas represent a period of her work in the 1980’s which is virtually unknown and are shown for the first time together in this exhibition. In 1980, several years after completing her seminal multichannel video and textile installation, Text and Commentary, Korot began to weave her own linen canvases and invented a coded language based on the grid structure of woven cloth. Babel 1 (1980) and Babel 2 (1980) translate the Tower of Babel text from Genesis into this language. The Tower of Babel interested Korot because it is an ancient text about the impact of technology and language on human behavior and cultural change, issues she’d been concerned with as an editor of the video journal, Radical Software (1970-74). 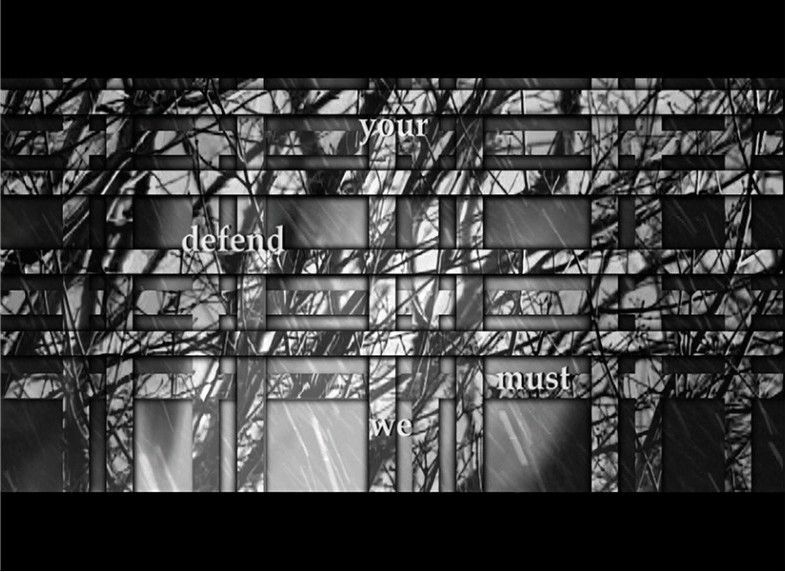 Years later, in 2006, she revisited her coded language in an animated video and print work titled Babel: the 7 minute scroll. Here the story is retold in several languages scrolling at different speeds: English, hieroglyphs, and Korot’s own. In the paintings, Anordnung: Clearly Visible/Strongly Sewn (1985) and A=Girl (1986), Korot uses traditional canvas where the visible structure of the grid is less apparent and a more calligraphic gesture becomes a landscape for the human figure. A young girl from a photograph from the Holocaust appears silhouetted in these paintings. In Anordnung she appears as a patch, amidst both the landscape of Korot’s abstract language and the specific words, “one language one speech,” which refers to the first line of the Tower of Babel. In A=Girl, the silhouette appears as the letter “A” in L-A-N-G-U-A-G-E, spelled out at the top of the painting. These paintings are created from layers of oil paint, washed away in turpentine and embedded in the cloth to create a palimpsest of recorded time. Etty (2009-2010) is a video inspired by the diaries of Etty Hillesum, a Dutch Jewish writer living in Amsterdam at the time of the Nazi invasion of Holland. To get messages to friends she devises her own code: book=butter, writing=jam, ink=rye bread, shoelaces=fruit. When she is finally transported to Auschwitz, she manages to throw a postcard from the box car with the words “we left the camp singing.” The slow, rhythmic falling of words against a background woven from moving video images, creates a new sense of reading and time. A soliloquy is created from short selections of Etty’s words edited from hundreds of pages of her writings. Korot’s recent series of digitally embroidered drawings, Curves (2016-2017) refers back to Text and Commentary, which places ancient and contemporary technologies in dialog, tracing the origin of the computer to the loom. This exchange is continued through the exploration of the artist’s hand and that of the machine: here a sewing machine programmed to sew the surface of the paper in pre-designated areas. The texture, color, and shape of the sewn thread contextualizes and converses with the original hand-drawn marks.